Perceiving that a healthy banking system is capable of absorbing market disturbances, thus being a precursor to economic development, the State Bank of Vietnam (SBV) has attempted to adopt Basel Accords after the Asian financial crisis of 1997 with the aims of strengthening financial supervisions and regulations on the banking system. Considered as one of the core provisions in the Basel Accords, bank capital requirements put forth and taken as prerequisite obligations in Vietnam have been stricter and stricter over four phases (1999-2004, 2005-2009, 2010-2016, 2017 and up to now). Hence, the Vietnamese commercial banks have always been under a high pressure to raise their capital adequacy ratio through three options: (1) increasing their capital, (2) cutting down their lending, and (3) reducing risky assets. These responses of the commercial banks would affect the whole economy in different directions and magnitudes. 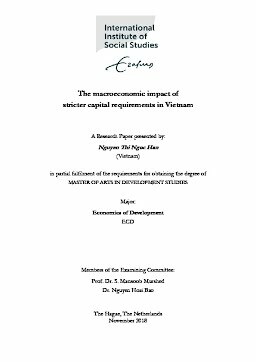 Motivated by the context of Vietnam and the effectiveness of these requirements in Vietnam, the research paper is to explicate the impacts of higher regulatory capital requirements on the banks’ behaviours and activities at first through applying Panel-data analysis. Secondly, by using Vector Error Correction Model (VECM), the impulse responses of the credit supply, bank-risk taking, and the output level to a shock of capital adequacy ratio will be investigated, together with looking into long-run relations amongst these factors. It is worth highlighting the findings that the commercial banks are inclined to reduce the incentives towards risky assets in the short run and try to increase their capital, but unlikely to cut down their lending, which leads to a deterioration in the financial stability of the whole banking system.